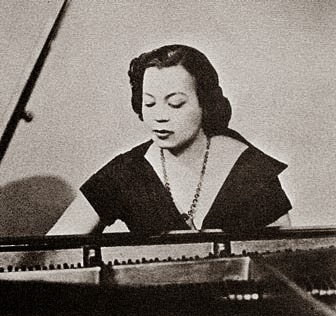 The AfriClassical.com page on Margaret Allison Bonds (1913-1972) makes extensive use of the research of Dr. Dominique-René de Lerma, http://www.CasaMusicaledeLerma.com, who has compiled a comprehensive Works List for her. We have all encountered reference to a spiritual as "traditional," or arranged by -- for example -- John Work. These terms seem to be applied in publisher catalogs and on recordings when dealing so often with the spiritual. This makes a problem when we are gathering together the output of a specific composer or when we are registering the citation for inclusion on a recital program. The international dictionary of Black composers (Chicago: Fitzroy Dearborn Publishers, 1999) editorially omits the spirituals altogether, even in the instance of Burleigh! Look what happens to Bach, however. As an illustration, if we are performing his 4-part harmonization of Ein feste Burg, do we list this as merely "traditional" or forget JSB all together and credit Martin Luther as the composer? No, while the melody is said to have originated with Luther, the setting is by Bach. Wolfgang Schmieder in Der musikalischen Werke von Johann Sebastian Bach (Leipzig: Breitkopf und Härtel, 1958) counts this clearly as a work by Bach and assigns it a catalog number: BWV [Bach Werke Verzeichnis] 303. It is so listed on concert programs, on recordings, and in publisher catalogs. Why then do we allow such sources -- especially recordings -- to ignore the work of Margaret Bonds, John Work, Harry Burleigh, Robert Morris, Charles Lloyd, and those others who have made settings -- not arrangements -- of spiritual melodies? The Library of Congress acknowledges the composer when there is something different (harmony, for example) in comparison with the original source. That is always the situation with any spiritual. Then what is an arrangement? That is when a pre-existing work is taken in toto and set for a different medium. Leopold Stokowski's dressing up so many organ works of Bach in orchestral garb constitute arrangements. He has merely, if not historically accurately, reset a work for organ as one for orchestra. There exists no original printed source for the spirituals. These belonged to the oral tradition, with or without harmony, for solo voice or an ensemble, depending only on the performance, not a score. The published transcriptions of these melodies from the repertoire of the singers at Fisk University or the Hampton Institute provided the SATB version as they were sung. Those who provided the harmony are not identified, but the transcriber-editor is not anonymous. When a faculty member is preparing the annual report, this becomes a basis for tenure or promotion decision. If spiritual settings are listed, these must not be dismissed as mere arrangements only because they make use of a pre-existing melody. It would be a mammoth task to acquire all recordings of, say Deep river, to listen to these and compare them with the published settings by all who have treated that music in an effort to rejoin the work with the composer -- as it was on the publication when the work was recorded, but then ignored when the recording was issued. That huge remedial task has been in on the agenda of soprano Randye Jones, whose ambition could be aided if we continue to refuse acknowledgement of the composer.